Big Island Fishing Charters. Many are offered at discount pricing. 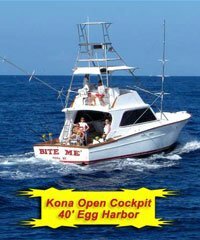 The "Mecca" for sport fishing in Hawaii where you find the famous Big Island fishing charters is the world renown Kona sport fishing coast. 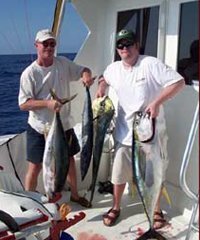 The Kona Sport Fishing tours are ideal as the Kona Coast lies immediately adjacent to a huge ocean drop-off which descends thousands of feet to the ocean bottom. 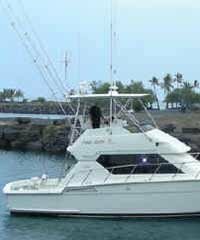 This provides easy access by Big Island fishing charter boats to some of the world's largest game fish, many of which can be found mounted throughout the stores and restaurants of the small town of Kailua-Kona. Anglers from all over the world have found their way here to participate in one of the most exciting of all forms of fishing - Big Island of Hawaii Sport Fishing. The thrill of hooking into one of these large Hawaii sport fish (the Pacific Blue Marlin can reach hundreds and even over a thousand pounds in weight) and attempting to bring it on board is something you will never forget. Once you've hooked into your first Hawaii sport fish, you'll be hooked as well! 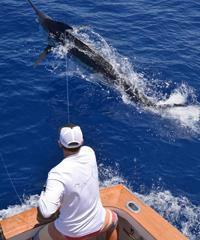 You'll be back time and time again for the thrill of the pursuit and the excitement of the big game fishing in Hawaii. The Kona Sport Fishing fleet is enormous! 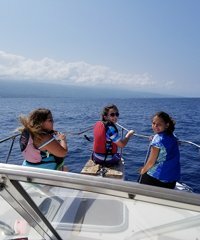 There is a huge fleet of fishing boats available for charter on the Big Island of Hawaii and many are among the most beautiful to be found in the state. 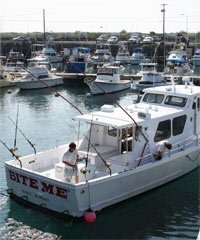 Pricing on these Big Island fishing charters is very, very reasonable compared to other islands in the state. 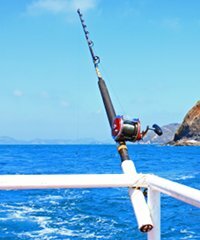 It is ironic that some of the best sport fishing in Hawaii, and in fact the world, on some of the most beautiful sport fishing boats in Hawaii, could be found on the Kona Coast of the Big Island at the very lowest prices. If you have the slightest interest in sport fishing, the Big Island of Hawaii is the place to do it. These are the likely types of fish you will catch on your Big Island Fishing Charter. 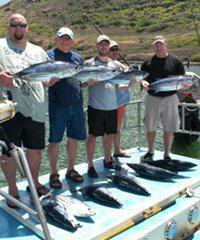 Private Hawaii sport fishing charters book the whole boat for the exclusive use of you and your group. 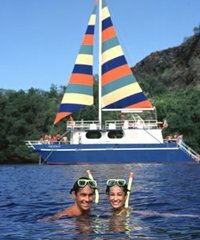 Most Big Island boats either simply prefer, or actually exclusively only permit private charters. You may choose to hire a "share boat" with a group of people. The maximum is usually 6. Minimum is often 4 passengers. If you are only one or two persons wishing to go on a share boat you will need to wait until another couple is found by the boat to share your charter. 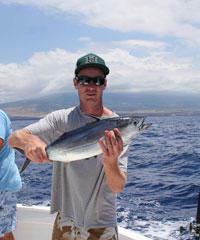 Hawaii fishing charters are available for various trips lasting 4, 6, or 8 hours. 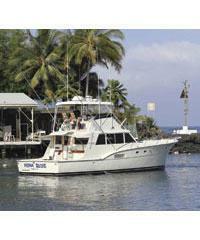 Big Island charter fishing trips can leave in the morning or afternoon. If you're really serious about sport fishing, book a 3/4 (6-hour) or full day (8-hour) trip. This gives your fishing charter the best opportunity to reach the major fishing grounds and spend some time there. The "tag and release" option is available on some boats. Discuss this with the captain at the beginning of your trip. As is the case on the other Hawaiian Islands, the catch is generally kept by the boat and sold to local restaurants as a means of supplementing the high costs of operation of these boats. Special arrangement can be discussed with the boat captain in some instances. Clients will normally be given enough fillets to take home to enjoy a fish fry on their return to their condo that evening. Hawaii sport fishing captains and crew are great fishermen, but you'll be pleased to know they won't be making your lunch. Bring your own food and drink. All equipment, licenses and ice are provided by the boat. 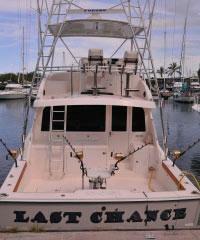 Kona Sport Fishing Charters do not pick up at the Cruise Ship Dock. The majority of these sport fishing charters however can be reached by a short taxi ride from the dock. These would be available to you on the Wednesday morning of your cruise ship schedule from the port of Kona. 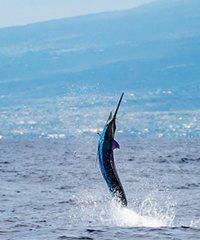 Since the mid-fifties Kona, on the Big Island has been 'the place' in Hawaiii to fish! 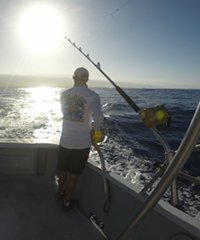 What is the best time of year for fishing the Kona Coast on the Big Island and which types of fish are caught in the various seasons? 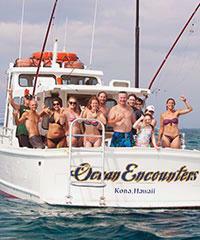 What makes Kona, Big Island sport fishing charters among the most sought after the world? So without a doubt, the very best place that you can do sport fishing in Hawaii is going to be on The Big Island. This is my son. This is a fish he caught on one of the boats off there. That's his game face. He's pretty serious about sport fishing. And let me show you, use this, one of the reasons that this is such a great place for fishing. It's the peculiarity of the island itself, kind of how it's located and so on. All the sport fishing coast that we have, on The Big Island is the Kona Coast right here. And one of the things that makes it in all likelihood, such a great place for sport fishing, is the fact that just off the coast the island just drops down, huge. Really deep water off the coast here, but it happens just like that. I mean right off the harbors that we have, just within minutes you're down thousands of feet. And see you've got the big fish that come out of the Pacific. They kind of hit against the sides of the big island, and then they kind of work their way up. And somehow, for some reason, this creates a place that these big fish show up. So if you're looking for particularly what the Big Island of Hawaii is known for, is the Pacific blue marlin. These are the huge fish. These are the thousand pounders. You'll see it as you cruise through the restaurants and so on in Kailua-Kona, the giant fish that they've got mounted on the walls. 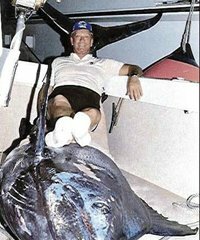 Huge, immense, immense fish that were caught there. And this has been the case for years and years off Kona. It's been well known as a place where you catch the big fish. Lee Marvin I remember in the old days, used to go there and spend time and kind of party and fish. And it's kind of got that real sport fishing sort of demeanor to it. It attracts a lot of people that are really, really into sport fishing, and we have tremendous amount of sport fishing boats that are there. But you get these giant Pacific blue marlin but you also have the mahi mahi and the skipjack and the yellow fin tuna and the Ono and the mahi mahi. And all the fish that Hawaii is really known for, and that are all served up in the restaurants every night off the coast of Kona in the cities, in Kealakekua and all the restaurants. So this is a fantastic place for fishing. You go into Honokohau Harbor, there are so many boats. Way more than you'll see in the other harbors that fishing boats than you'll find on other islands. And that's a testament to the fact that there's such good sports fishing out there. We have lots of different sport fishing charters that you can take. We go out for half days, which are four hours. We go out for three-quarter days, six hours. Full days are eight hours. And you sign up with a boat, and you're off, and you're doing this incredible sport fishing all day. The charters are basically divided into two different categories. You can do a share boat, or you can do a private. Now, there's a much higher degree of privates that you'll find on The Big Island than you will elsewhere. Although, there are shares as well. And what the difference is, on a private, you've got the boat. You've booked the boat for a full day, or a three-quarter day, or a half day. Most of these boats, you're going to find, are six passenger boats. But when you've got it as a private, you can take the boat out just by yourself, or maybe you and a friend. Or, you can actually take six people on the boat. But you're paying a special price for the boat, and it's yours. So the relationship that you develop then with the captain is a little bit different than on a share boat situation. He's interested in catching fish for one thing, as well as you. But you guys sit down and kind of talk about it together. He's going to know basically what's happening, and all of that. He may give you some options. You know it may be a particular type of fish that you're looking for, maybe a more likelihood to go north or south. You'll discuss that, and the type of lures you might use and all that sort of thing. So you've got a lot more discretion that you can have with regard to fishing when you take a private charter out. And to tell you the truth, these guys, these fishermen are so serious about fishing on The Big Island, that they'd rather go with a private charter, because they will probably have a more likelihood of catching fish. But that being said, you can do shares too. And sometimes it's just ... It's certainly more affordable. Sometimes you know, you can't put up all the bucks for a private. And they realize that, and they make a lot of charters available for share boats. But what that is, is you've got maybe you're a couple. And you want to go out on the boat. Well there's six seats on the boat, and you could be two of them. So you pay a lesser amount to go on the boat. And then you're hooked up with maybe four other people, and so you're going out, and everybody's enjoying themselves, and participating in this together. The problem that we have with shares quite often is that if you're the first couple. You're a couple. You get a hold of us and you say, "Yeah, I want to share a boat. Can we arrange for that?" And then we call around. If the boat doesn't have anything on it, we can't get you out on it. They need a minimum generally, of four people to go out at all. For them to consider that it's worthwhile for them to make any money to do it. So then we have to kind of maybe put you on a wait list, or keep trying other boats. If there's a couple that's already signed up, bingo, we're just right there. We've got four people, and we can take you out. So it's confirmed, and then there might be another couple that comes along. They'll try to maximize it, and try to get to the six people. So those can work that way too. We can get you on the share boats, but it is a little bit more difficult, than on the privates. One of the things that always needs to be discussed when we're talking about the fishing in Hawaii, and this is kind of universal, is that the fish by and large are going to be owned by the fishing boat. Yes, you paid for it. Yes, you were the guy that was on the other end of the fishing pole that caught it, but the fishing boat guys are the ones that are going to actually own this particular fish. And what they're going to do, is they're going to sell it. Why this is part of the game in the sport fishing here, is that it's so expensive to take these boats out. The fuel just keeps going up and up. And you've only got small groups of people that you're taking on. So how they subsidize their trips, and how they justify actually going out, is at the end of the day, to take the fish that were caught and then sell them to the restaurants or the various people that are going to buy. And that's how they make some additional money. Does this mean you're not going to get some fish? No. It doesn't. In all likelihood they're going to say, okay, well how many people do you have back at the hotel or your condo tonight? Here's enough filets, and they'll carve it off, you guys can have a nice fish-fry, and you've got all the pictures to show the fish that you had and so on. I mean really what are you going to do with a giant fish anyway? You're on a vacation. I mean what? Throw it in your rental car and drive it somewhere. It's probably not going to work. So that's the way it happens, if you get a really big fish, there's services that we can arrange that you can mount the fish and so on. But those are specialty cases. Generally speaking, this is what's going to happen with the fish. And that being said, all these boats are really individual. They're different. They'll have different policies. So it might be a good idea just to run that by to begin with, to know what's going to happen with the fish that you get, so that there's no problems afterwards. The other thing that really should be said about sport fishing off the coast, and this is really kind of an unusual thing, but it's very cool. So what do we have? We have the most incredible fishing that we've go in all of Hawaii, right off this coast. Also, because it's such great fishing, we have more fishing boats than we probably have anywhere else in Hawaii. But that creates a dynamic where there's more competition for people that are coming on that want to go out and do sport fishing. And so you get some of the best fishing in the world, that happens really at the best pricing. In many cases, you can check the pricing of many of the boats that happen off the Kona Coast and compare them to other places in Hawaii, and you'll see that the pricing maybe somewhat better. Which is really a little bit odd, when you think about it. Here you've got this great fishing at this really great price. So if you're thinking about doing some fishing, if you've got your choice of islands that you're going to go to, and you know you're going to be going to the ... If Hawaii's going to be one of them, and you want to do a fishing charter. Do your fishing there. If you're going to pick a vacation for fishing, and you've got your choice of islands. Go directly to The Big Island. 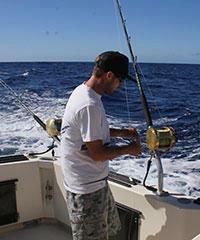 This is generally considered the best fishing that you're going to find in all of Hawaii.